A misguided decision by Los Angeles County welfare officials inspired Haleemah Henderson to champion banking services for the poor. Officials had decided to spread the issuance of welfare checks over the first ten days of each month, which was convenient for them but impossibly late for many of the half-million welfare recipients who would be penalized if their rent was not paid on the first of each month. Worse, the county disbursed its money through check-cashing outlets, which charged fees for their service rather than banks, where the money might gather interest. A veteran of the welfare system herself, Haleemah knew how cruelly the financial system discriminates against the poor and set out to change it. She began to advocate welfare reform as a member of the Community Coalition’s People on Welfare, won a HUD fellowship to attend college and was one of the first students in the country to graduate with a degree in Community Planning and Economic Development from a two-year college. On June 15th, 2002, Haleemah received her master’s degree in Urban Planning from the University of Southern California. 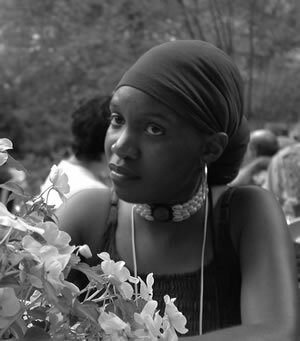 While studying for her degrees, Haleemah joined Strategic Actions for a Just Economy (SAJE), first as an intern and later as the lead organizer of its Banking Rights Program. In this capacity she organized welfare recipients and taught them financial literacy. She and her team persuaded bankers and county officials to create the first welfare-to-work bank accounts, into which welfare checks could be directly – and safely—deposited. It was her pleasure to become the first to open one of these new accounts. In addition, Haleemah collaborated with the Consumer’s Union, the California Bankers’ Association, and the Western Center on Law and Poverty to pass a law requiring all California welfare agencies to offer direct deposit services to over a million and half families statewide. To lobby for this bill, she and a team of activists and their children rode buses from Los Angeles to Sacramento. Haleemah also founded SAJE’s Peer Financial Educator’s Program, which trains community members to teach financial literacy and offers internships, stipends for in-service learning opportunities, and job placement services to women on welfare. SAJE’s financial educators are now implementing similar programs throughout the state, using their new-found skills and confidence to help families, friends, and neighbors combat discrimination in the provision of financial services. Currently Haleemah is challenging LA County’s Electronic Benefit Transfer System, which allows access to government benefits through ATM machines but does not provide for an interest-bearing bank account. She is also working to extend banking opportunities to undocumented workers by granting them Temporary Identification Numbers and seeking to initiate financial literacy programs at immigrants rights organizations.